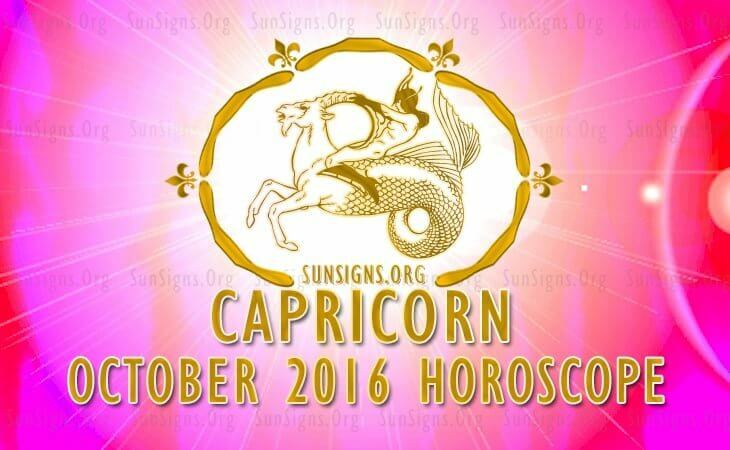 October 2016 Horoscope for Capricorn zodiac sign predicts that this is a month for professional accomplishments. The emphasis will be on career matters and personal achievements in for the Sea Goats. Your success is based on psychological stability. Capricorn, most of the planets are in the Eastern half of the birth chart towards the descendant sign. You can get things done your way and follow your goals with aggression. You don’t need the support of others and there is no need for flexibility. However social charm and skills will boost your progress in life. The Capricorn October 2016 astrology forecasts foretell that career will be challenging and requires plenty of effort. This will be rewarded with increase in pay and promotions. You will have more responsibilities and your family will be highly supportive of your hard work. The middle of the month will herald major changes in business which will be for the better. Money earnings and prosperity will be phenomenal for the Capricorn born people in October 2016. Family members will have a successful month financially. Speculative ventures will be profitable for your spouse or love mate. Major expenses require thorough scrutiny. The October 2016 Capricorn monthly predictions suggest that love will be without surprises and you will be happy with your current partner. Friendships and social activities are more important than romance. You are enlarging your social circle with new friendships being made and you will take part in the activities of social groups. The Lunar Eclipse may put Capricorn in love under the scanner. Children will be forced to make major changes in their academic careers and this will impact your relationships with them. Love life for single Capricorn will be at its best in October 2016. People in committed relationships are likely to get married or plan for a baby. Capricorn sexual desires will be staid and boring. Capricorn, your health will be delicate till the third week of October 2016 and requires more attention. Fitness can be enhanced by walking daily and doing some yoga exercises. Cleansing the body of toxins will help restoration of energy levels. Be sure not to skip meals in an aim to lose weight fast. To conclude, October 2016 Capricorn horoscope suggests a promising and stable month in all aspects for the sea goats.